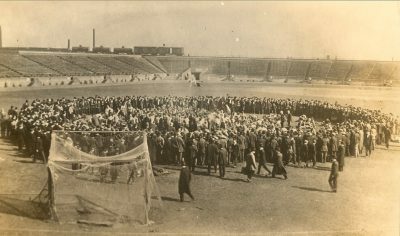 The Bowl fight held the fascination of many a Penn class and was one of the most popular events of its time. There was also, however, a steady buildup of faculty opposition to this sport which expressed itself in constant rule changing to tame the game. Despite concern over the roughness of the bowl fights, the fight was cancelled only once, in 1887. And after that year’s break, the bowl fight resumed with even more fervor and ferocity. 1916, however, was the ill-fated year in which one of the most determined bowl fights resulted in serious injuries and death. William Lifson, Class of 1919, died even before he reached the hospital. In spite of all efforts on the part of the doctors he could not survive. There were also at least five other men who needed serious medical attention because of the fight. In the face of such a tragedy, the students themselves decided to get rid of all student fights, terminating an exciting tradition at the University of Pennsylvania. Whether it was for good or for bad is more a matter of personal choice. But this tragedy definitely was the end of the great bowl fights. William Lifson, ’19 C, Succumbs After Contest which Badly injures three others. William Lifson, a Freshman in the College, is dead as a result of the Bowl Fight. Three Sophomores are in the Students’ Ward, two men were treated at the Gymnasium, and fully a score of others were injured, in one of the most determined Bowl Fights ever held. The Freshmen won the contest with a score of 36 to 28. It was after the last whistle, when the marshals were counting the hands, that Lifson was picked up unconscious. He was immediately taken to an open spot, where several men worked over him. A motor truck was impressed into service and he was rushed to the hospital, but he was dead when he reached there. As a last resort, the pulmoter was applied, but life was extinct. Everything possible was done for the man. His brother, Edward Lifson, ’17 Wh., was summoned and took charge of the remains. His brother-in-law also came. The latter said the he did not believe that there was any student responsibility and that he did not believe that any action would be taken. The remains are being held at the University Hospital pending the Coroner’s inquest, following which it will be shipped to Elizabeth, N.J.
Lifson was in his first year in the College. He was out for the wrestling team and showed much prominence. He lived at the Phi Epsilon Pi Fraternity House of which he was a member, rooming with his brother. His home is at 205 West Grand Street, Elizabeth, N.J.
Five men were seriously injured. Besides these there were more than a score of cases treated in the receiving ward of the University Hospital. The following five men were more seriously injured: Gordon S.C. Smyth, who was at first thought to be in critical condition, was finally found to have only a slight concussion of the brain. He is in the Student’s Ward and will be out in a few days. John Hill, ’18 C., dislocated his knee. This is the seventy-sixth time he has met with this mishap. It was reported that he would leave the ward tomorrow. Arthur T. Eissing, ’18 Wh., was seized with muscular cramps. As soon as these kinks are removed he will be able leave the ward. William G. Hopkins, ’18 C., was treated at the Gymnasium. He was slightly exhausted. Robert Dunlap, ’18 Wh., was treated in the same manner. The injuries of the other men consisted of minor cuts and sprains. The Freshmen were victorious in the fight. Under a clouded sky and on muddy ground, nearly three hundred first year mean gathered on Museum Field yesterday afternoon. Facing the 1919 men were two hundred strong Sophomores, full of confidence. Head Marshall Chickering, after explaining the fight and giving final instructions, started the first half at 1:15 o’clock. Ingolfe Ertresvaag, captain of last year’s Freshman football team, was the first year bowl man. Both Classes rushed forward. After five minutes of surging, the mass was divided into two sections, one crowding around the bowl man and the other around the bowl in another part of the field. After fifteen minutes, with neither side progressing, the Marshall’s whistle was sounded and the half was declared a draw. Following a seven-minute rest, the second half of the fight was started. Almost as soon as the whistle blew the compact Sophomore phalanx was covered with fighting Freshmen. Their barrier was broken down and a general scrimmage ensued, centering around the bowl. At 1:52 o’clock, fifteen minutes after the second half started, the final whistle was blown. The marshals then began to count the hands, and finally declared a victory for the Class of 1919, with the score of 36 to 28.